We went up to Crater Lake National Park and the Shasta Lake National Recreation area over the July 4th holidays. Some key highlights & lowlights of the trip below. From San Jose to Redding: We left San Jose around 3pm, took the 680 freeway heading to 80E. The route was 680N-80E-505-5N. As I drove through the Benicia bridge toll plaza on 680, it got a bit confusing with lanes splitting into three - Fast Trak pass, Carpool and Cash. I took the carpool lane, since we had enough people in the car and it was carpool hours, but wasn't sure if it meant Fast Trak carpool or any carpool. There were cameras, so I guess I will know if I was wrong in a few weeks! The stretch between Benicia and freeway 80 has always had strong winds every time I have driven through, enough to feel the car sway. Not sure why, but I guess everyone survives, so it doesn't matter. After reaching Vacaville on 80, we took the bypass freeway 505 to get on 5N. This was the first time I have taken 505 - it is pretty quiet and fairly dry landscape. We reached the junction of 5 and 505 around 5:30pm, and stopped at the Pilot travel center to grab a bite. Another couple of hours drive, we were in Redding, which is the closest city just before Shasta Trinity National Recreation area. In Redding: I had booked a room at the Best Western Inn on Hiltop Drive. Wasn't too impressed - they gave me a non-smoking room, but it was clear someone had been smoking inside before. It was obvious now why they took a signature during check-in, that if they smell smoke in a non-smoking room after check-out, there would be a special air clean-up charge - clearly, they have had this problem for a while. The hotel manager sent someone to throw some perfume, but it only helped little. It wasn't easy to move with the family, so I just settled in, giving them the benefit of doubt that it could be the smoke from the forest fires going around (I later heard there were 1000 of them, and fire-fighters managed to bring it down to 800 thus far!). The saving grace was the good breakfast, with the wide choice of oatmeal, breads, fruit, and full service grill. Any case, the smoke wasn't worth $130 a night, so I simply decided never to book a Best western again. We had dinner at Priya's Indian cuisine on Churn Creek Ave, and that turned out not as exciting as well. Redding to Crater Lake: Thursday morning around 9:30, we left Redding. The drive up 5N goes through Shasta, and is pretty scenic. After about an hour, we saw Mt Shasta towering over 14,000 feet. It was pretty dry now, with some precipitation just at the top. I ha ve been there in May once before, when it is mostly wrapped in snow. 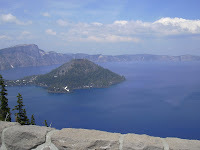 The Google map asked me to take US-97 highway to Klamath Falls, and then take OR-62 that leads to Crater Lake. So, we forked off to US-97 at this small town called Weed. The drive on US-97 was extemely quiet, patches of water and green, with almost no traffic, and the only civilization was some remote motels appearing once in a while. I learned some thing new - this was one of the "All American Road", which is a federal designation for certain roads less traveled but have tourist potential due to scenic, cultural or historical interest. The motels look dilapidated and makes you wonder if it was a thing of the past or if it is still functioning. After a hour and and half drive on US-97, I saw a visitor center and stopped by to ask if I was indeed on the right track. The ranger gave me the good news that I am indeed on track, as well the bad news that I am still another hour and half away from Crater Lake! 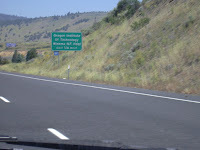 We crossed the small town of Klamath Falls, and headed towards Modoc point. The road got pretty interesting and a bit scary here with the huge Upper Klamath Lake to the left, seemingly threatening to spill over and flood the road, and a mountain a few miles out in fr ont, that made me wonder if there is even a road once I reach the intersection of the mountain and the lake. Finally, we saw signs indicating Crater Lake and leading us to OR-62 highway. 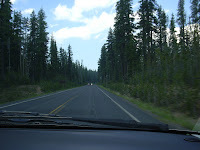 We took a left on OR-62, and the route was a bit more scenic with the typical tall conifers of Oregon. Parts of OR-62 and US-97 comprise the "Volcanic Legacy Scenic Byway". 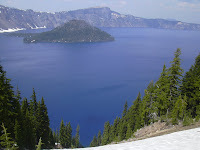 Another 40 miles on OR-62, and we reached Crater Lake National Park. 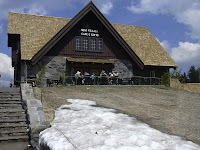 Inside Crater Lake National Park: There is a restaurant just before the park entrance. It is better to get lunch here. There is a cafe inside the park with limited options (the ranger at the visitor center told me there is a restaurant in the lodge, I couldn't find it, but I could be mistaken). We paid the fee ($10 per car), and drove another 7 miles to get to the lake. We saw some precipitation as it was now about 7000 feet elevation, and stopped to take some pictures on the snow. As I was about to park, there was this idiot driver in front, who just passed the spot, but hurriedly backed up to regain his spot! I honked, but I think it didn't ring in his ears, and before I could react backing up, he was almost there. I gave him a stare and passed on to find ample parking space just a few feet down. By this time, we were very hungry, so the first thing on our mind was lunch, though we caught a glimpse of the lake as we drove into the parking lot. We settled for pita sandwiches at the Rim Cafe, and then walked up to the rim of the lake. The view was well worth every mile we drove the last 3.5 hours. We took some pictures, and drove around the rim to another viewpoint (called Discovery point) at a slightly higher elevation, and took more pictures. It is possible to drive around the entire 35 miles around the rim, but we had to trade-off with little ones in the car that might get impatient. Heading back to Redding: As we headed out of Crater Lake, I made up my mind not to drive through Klamath Falls again, but take OR-62 towards Medford, where it meets Hwy 5. This was a pretty good decision, as it is pretty scenic as the road goes along parts of the Rogue River white waters, and there is more civilzation or greenery than the US-97 route. Once we got to Medford, we took 5S, heading back to California. It was pretty scenic going through the mountains, but there was also smoke from the forest fires. I was juggling between driving uphill and keeping the air conditioner switched on to filter out the smoke. We passed Yreka, another historic town, and got back to Weed, where we had originally forked off on US-97. 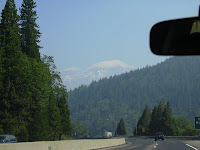 We continued on 5S, catching another glimpse of Mt Shasta, and headed back to our lodge in Redding. Though it was a lot of driving, it was a fulfilling and memorable experience. We had a good sleep, that refreshed us for the Shasta trip the following day.